Pioneering processes, latest machine technologies, innovative applications – this is what WITTMANN BATTENFELD will show to trade visitors from 16 to 23 October at the K in Düsseldorf. In 2013, the WITTMANN Group will present itself again with two booths at the K in Düsseldorf. The machines from WITTMANN BATTENFELD GmbH will be on display in hall 16, booth D22, the robots and peripheral equipment from WITTMANN Robot Systeme GmbH will be showcased in hall 10, booth A04. “Power for the future comes from today’s innovations” – true to this conviction, WITTMANN BATTENFELD has made innovation for the customers’ benefit its top priority. Innovative solutions are distinctive features of this company’s machines, but are certainly not limited to the machinery only. 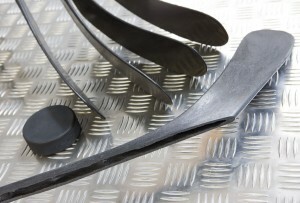 Innovation is also a major concern in the areas of process technology and service. Under the motto “Power for the Future”, WITTMANN BATTENFELD is presenting its highlights in Düsseldorf, with the main focus lying on the machines from the PowerSeries. The trade fair highlights in the area of compact, large-scale machines will be the new MacroPower 1500 and the MacroPower E 450 in a hybrid version, with an electric injection unit and a servo-hydraulic clamping unit. 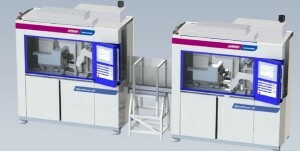 A production cell consisting of 2 “MicroPower 15” machines will demonstrate a state-of-the-art example of “lab on a chip” production for the medical industry. An absolute highlight of this year’s product presentation at the K will be the new MacroPower 1500. With this model, WITTMANN BATTENFELD has extended its portfolio of MacroPower large-scale machines to 6 sizes, ranging from 400 to 1,600 t in clamping force, and has thus established itself as an important player in the field of large machines. The MacroPower 1500 stands out above all by its space-saving design and the possibility of lateral mold insertion, factors which play a vital part in machinery of this size. The 1600 x 1250 mm diagonal distance between tie-bars offers ample space for mold insertion. Modular mold height dimensions and opening strokes enable optimized configuration of the MacroPower machines to suit each application. The machine shown at the K – a MacroPower 1500/8800 – comes equipped with ServoPower technology and features maximum energy efficiency and user benefit. The additional savings in cooling water consumption as well as extremely quiet running of the machine are further long-term benefits for the environment and the people who work with these machines. A ground shaft made of PP (Borealis) will be manufactured in a mold supplied by the Austrian mold maker IFW. Its 4 outlet apertures for pipes branching off are formed with the help of complex core pull technology. The core pulls are equipped with P/Q valves. Demolding of the part is effected with an “intermediate core pull stop” in the opening stroke. The parts are removed and stacked by a W853 WITTMANN robot. Another highlight at this year’s K is the presentation of a MacroPower E Hybrid. The MacroPower E 450/2250 consists of a modern, servo-hydraulic 2-platen clamping unit combined with an all-electric, high-speed injection aggregate. 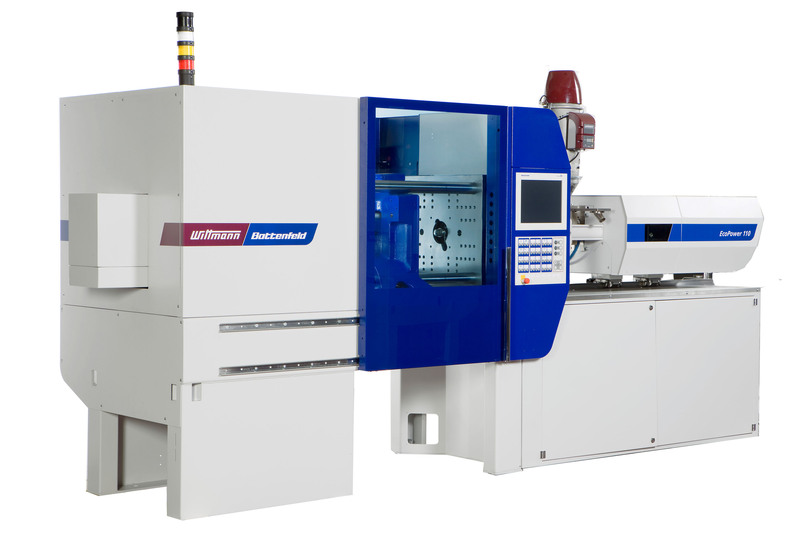 This combination has made it possible to produce a compact large-scale machine with a minimal footprint, which simultaneously offers the ultimate in terms of precision and energy-efficiency at high injection speeds of up to 450 mm/sec. This enables the production of high-precision technical plastic parts, as well as packaging components, with an extremely low energy input. On the machine, a high-performance mold supplied by Abate (Italy) will be shown producing a bucket. The IML aggregate from WITTMANN is a TW842 UHS top-entry unit optimally laid out for minimum operation times for parts removal from the mold and stacking of the finished buckets. 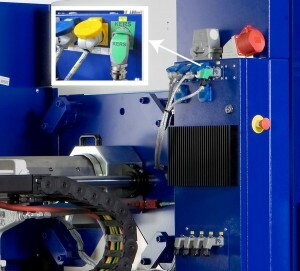 The IML robot takes the banderole labels from the vertically mounted label dispenser unit and inserts them into the cavity in the fixed mold half using a dummy core. To minimize the cycle time, removal of the finished buckets and insertion of the labels are carried out simultaneously. The MacroPower E Hybrid reaches Euromap class 60 energy values of 10+ and thus offers an optimal standard in terms of performance and energy efficiency for large-scale machines. At this year’s K, WITTMANN BATTENFELD is showcasing 3 exhibits featuring the all-electric, energy-efficient EcoPower. An outstanding characteristic of the EcoPower, in operation in large numbers worldwide, is its extremely low energy consumption. Its combination of drive technology software with KERS energy recovery technology, both developed in-house, results in top-class energy efficiency. The KERS (Kinetic Energy Recovery System) system specially developed by WITTMANN BATTENFELD for the EcoPower transforms the kinetic energy generated by deceleration processes first of all into electric energy. To make sure that not a single watt is lost, all axes of the EcoPower are included in this process, which for example also means the deceleration energy derived from dynamic injection processes. The electrical energy thus gained is partly stored, utilized by other drive units for parallel movements, fed into barrel heating or used to generate the control system voltage. In this way, the entire deceleration energy is recovered completely within the machine without any loss – unlike conventional mains feedback systems, mechanical concepts or even obsolete braking resistors. Moreover, KERS is even capable of bridging short mains power failures by supplying power from its own store of energy. Maximum uptime and productivity rates with minimal energy consumption – thanks to KERS. WITTMANN BATTENFELD is also a pioneer in modular combination of servo-electric drive technology with servo-hydraulic ancillary strokes. In this way, the optimal machine configuration can be created for every conceivable customer application. On an EcoPower 300/1330, equipped with “AIRMOULD®” gas injection technology from WITTMANN BATTENFELD, a hockey stick will be manufactured from LGF-PP (Borealis) in a mold supplied by Haidlmair (A). With the new nitrogen- and- pressure generator developed in-house by WITTMANN BATTENFELD, a gas channel with a length of 1300 mm is created inside this molded part. The hockey stick is produced by a partial filling process. First, a piece of sheet supplied by Verstraete (B) is inserted at the end of the flow path; here the gripper is designed for handling the insertion of the sheet as well as parts removal. To counteract warpage of the part over its entire length and keep the cooling time as short as possible, the parts are deposited in a cooling station specially developed for this purpose. The robot used is a W832 model from WITTMANN. The mold dimensions are 1750 x 396 mm; the extra-large clamping plates of the EcoPower 300 with a 770 x 720 mm diagonal distance between tie-bars are ideal for this purpose. The cycle time is 105 seconds, the cooling time 60 seconds. The energy-saving effect of the electric machine is particularly pronounced in cases of long cooling times. Since the motors are switched off, no energy is consumed during this phase, which makes for an extremely high degree of efficiency. In cooperation between WITTMANN BATTENFELD and Schaumform (D), an interior component in structured foam technology will be manufactured as a highlight in process technology. In this application, the WITTMANN BATTENFELD processes CELLMOULD® and BFMOLD® are combined with the HiP (High Precision Opening) opening program to enable the production of light-weight structured foam parts with a high-quality surface. The temperature controller required for the variothermic process is operated directly via the machine’s control system. The machine used is an energy-efficient, all-electric EcoPower 240/1330 equipped with the HiP opening program. 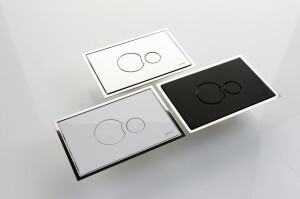 The mold and the manufacturing process have been developed by Schaumform. The process is being implemented on an all-electric toggle machine for the very first time. CELLMOULD® is a process for making structured foam parts, with nitrogen being added directly in the barrel during the plasticizing process. 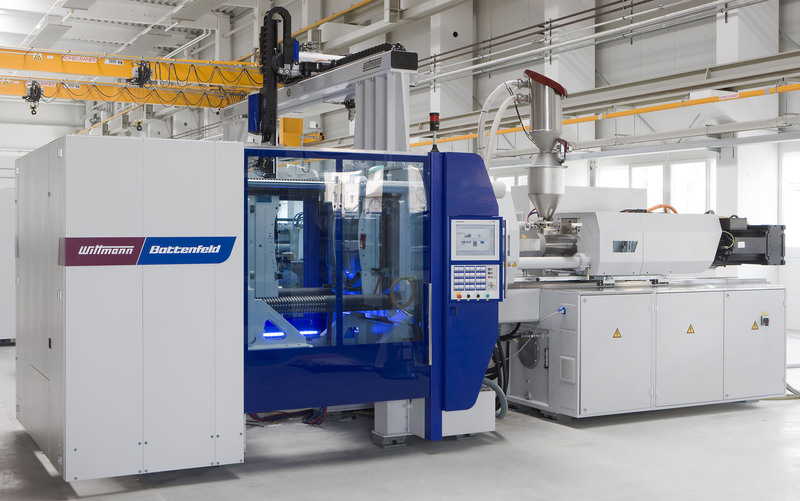 The entire machine technology, including the plasticizing unit, injectors, gas regulator and gas generator, has been developed and manufactured by WITTMANN BATTENFELD. By using this technology, substantial material savings can be achieved with simultaneous high dimensional stability of the parts. In this way, it has also become possible to reduce part weights, clamping force and cycle times. The application of variothermic BFMOLD® technology in combination with the special high-precision opening program enables the production of attractively finished, light-weight, high-quality parts. 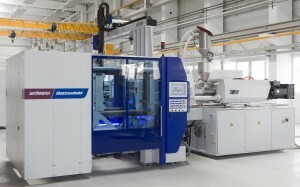 A WITTMANN W822 robot is used on the machine. On an EcoPower 110/350, LSR penholders will be manufactured in a 4-cavity mold supplied by RO-RA (A). The mold technology used allows molded parts to be manufactures from liquid silicone without sprue, virtually free of ridges, without waste and fully automatically. Thanks to their special design, the penholders adhere automatically by suction to any smooth surface when a light pressure is applied.The penholders are removed, deposited on a conveyor belt and filled automatically by a W818 robot from WITTMANN. 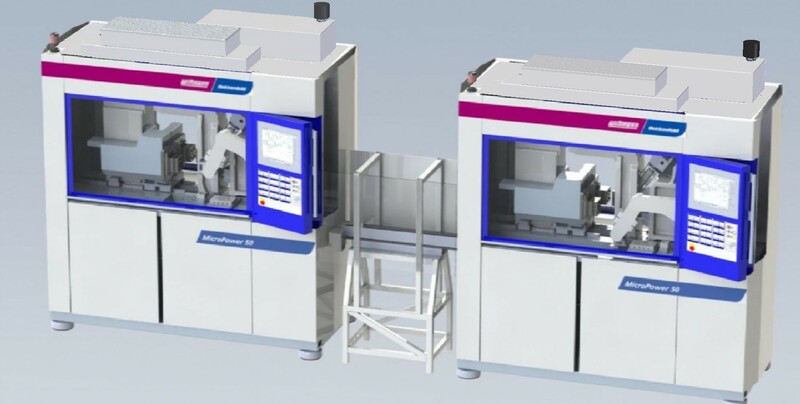 At the K 2013, WITTMANN BATTENFELD will showcase a medical technology application consisting of 2 MicroPower 15/10 machines, where a “lab on a chip” part for analyzing blood particles will be manufactured by assembly injection molding under clean room conditions. 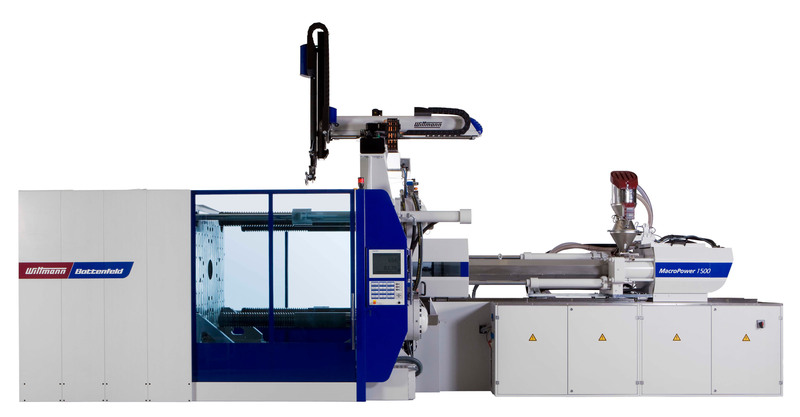 Both machines are equipped with WITTMANN W8VS2 Scara robots, rotary plates and clean room modules, and connected with each other by a clean room tunnel as well. 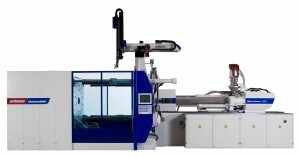 In a 2-cavity mold, the first machine produces the two carrier parts which, following removal, are presented to the inline camera inspection by the W8VS2 Scara robot and then immediately connected with each other on the transfer carriage. The servo-electric linear axis transports the complete part into the second machine, where the other W8VS2 Scara robot picks up the part and inserts it into the next mold, where the part is overmolded with TPE. Finally the W8VS2 Scara robot removes the finished “lab on a chip” again fully automatically and deposits it in a clean room environment within the machine. With this application, WITTMANN BATTENFELD underscores once more the flexibility of the MicroPower, combined with utmost precision for reproducible manufacturing of micro surfaces. 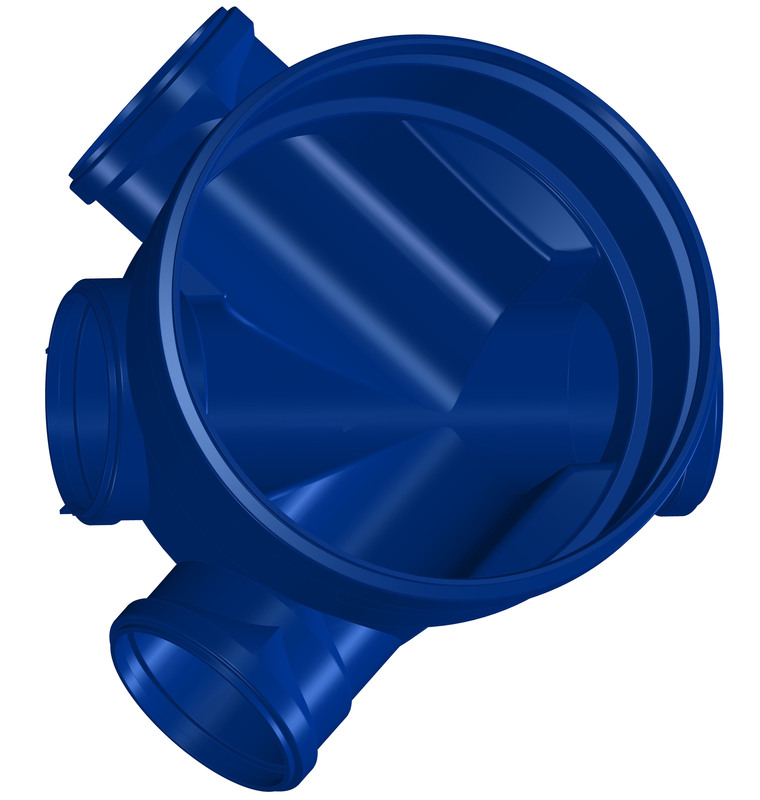 The product design and mold technology come from Microsystems UK. Microsystems is a global market leader in the area of developing injection-molded parts and processes for the production of micro parts to be used in medicine, optics and fluidics. On a hydraulic HM 110/525 ServoPower machine with an insider cell, high-gloss flush panels for sanitary installations will be manufactured in a single-cavity mold supplied by Sanit, Germany. The parts will be produced using the variothermic BFMOLD® process combined with the CELLMOULD® structured foam process. Following parts removal by a W818 robot, the parts are passed on to an “in-line surface inspection unit” integrated in the machine. By this method developed by PCCL (Polymer Competence Center Leoben, A) for the detection of surface defects, the entire surface of the molded part is checked for sink marks. In the BFMOLD® process, the entire mold area below the cavity is used for heating and cooling. This enables extremely even and, above all, fast cooling of the mold areas. This is why the technology is of interest not only for reducing cycle times, but also for preventing warpage and reducing tension. Moreover, it enables parts with a visible surface or molded parts with a high-gloss surface to come out without sink marks or joint lines. The second servo-hydraulic machine is an HM 180/525H/210S 2C model with a ServoPower drive. In a 4+4+4-cavity mold, an atomizer for the cosmetics industry will be manufactured from PP and SEBS (TPE). A process known as IMA (In-Mold Assembling) makes it possible to produce such complex hollow parts in a single step. For this purpose, the two half-shells are brought into an overlapping position by means of an adaptive index platen drive supplied by Grosfilley, F, which cooperates with a WITTMANN robot. In this position, the parts are subsequently joined together and sealed by overmolding. The WITTMANN robot simultaneously handles the removal of finished parts and deposits them on a conveyor belt. Thanks to the adaptive design of the index platen drive, which is integrated in the machine’s UNILOG B6P control system, the machine can be adapted flexibly to standard multi-component applications. Quality assurance, another major concern in WITTMANN BATTENFELD’s product development activity, will be demonstrated at the K by an application using in-line thermography. In-line thermography is a process developed jointly with the SKZ plastics center in Wurzburg, for which WITTMANN has acquired exclusive distribution rights worldwide. In this process, the parts are presented to a camera in several different positions immediately after demolding. The evaluation of the thermographic pictures is displayed on a monitor, any deviations from the release status are visualized and calculated for each segment for the connected WITTMANN FLOWCON flow regulator. Any temperature changes which may be necessary are thus implemented in real time. 2 variants are available: an open-loop version to display thermographic pictures and identify “short shots”, including a signal for good part / reject part selection, and a closed-loop version to display thermographic pictures and short shots, including a optional signal for good part / reject part selection and mold temperature regulation. The exhibition program of WITTMANN BATTENFELD is rounded off by a presentation of its WebService 24/7. WebService 24/7 stands for the online service from WITTMANN BATTENFELD, which is available round the clock on 7 days a week. Visitors to the K show will have an opportunity to experience the operation of WebService 24/7 first-hand via a live connection at the service center specially installed for this purpose. This service center provides information to visitors about the other services offered by WITTMANN BATTENFELD as well, such as customer support, application technology, training and the MES (Manufacturing Excellence System) WITTMANN BATTENFELD K4.